Director – Ralph S. Singleton, Screenplay – John Esposito, Based on the Short Story by Stephen King, Producers – Ralph S. Singleton & William J. Dunn, Photography – Peter Stein, Music – Brian Banks & Anthony Marinelli, Visual Effects – Syd Dutton, Bill Taylor & Albert J. Whitlock, Makeup Effects – Gordon Smith, Production Design – Gary Wissner. Production Company – Larry Sugar Entertainment. Ex-college student turned drifter John Hall takes a job at the Bachman Mill in Maine, working the wool picker on the dusk-to-dawn graveyard shift. Hall volunteers for a double-pay cleanout operation of the bowels of the mill planned by the mill’s cruel and autocratic foreman Warwick over July 4th weekend. During the midst of this, the work party fall down into the vast disused mine under the mill. There they become the prey of a giant rat. As somebody once observed, Stephen King could make money by selling his laundry lists to Hollywood. 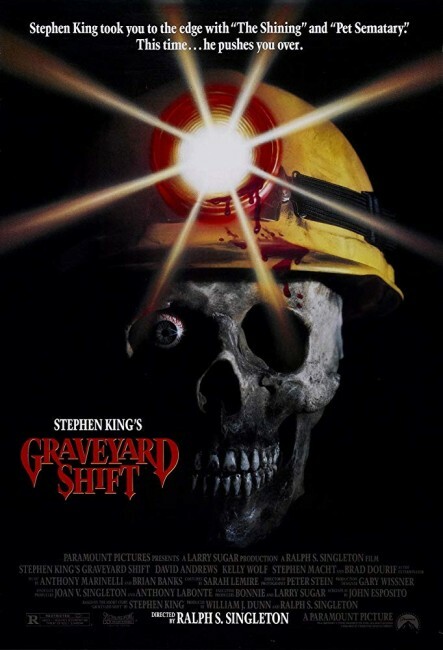 Graveyard Shift was adapted from a short story that appeared in King’s collection Night Shift (1977). Indeed, Graveyard Shift came in a year that featured a total of four other King screen adaptations – Rob Reiner’s Misery (1990), the tv mini-series of It (1990) and a segment of the anthology Tales from the Darkside: The Movie (1990). Graveyard Shift even comes annotated by in-jokey King footnotes – a Bachman Mill, one character mentioning that she comes from Castle Rock – as well as rat movies references – one character sits in a diner reading the novelization of Ben (1973). Graveyard Shift was ridiculed by Stephen King fans. Although to its favour, Graveyard Shift is at least not as slavishly bland as other adaptations like Children of the Corn (1984). 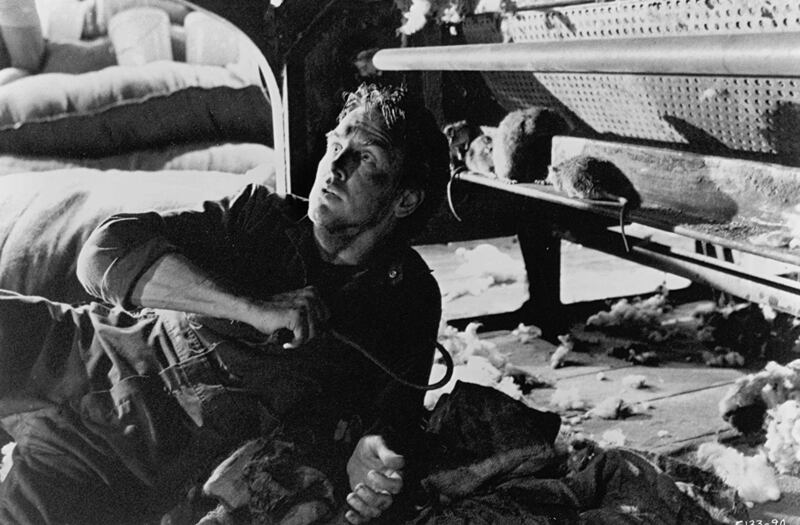 Actually, everything in Graveyard Shift is so overwrought – from the 500x size rat to Stephen Macht’s Southern accent – that it is contrarily a rather funny film. Character reactions are so overdone one might think they had accidentally strayed into some histrionic soap opera by mistake. The surly locals’ reaction to stranger David Andrews being in town is to serve him up a dead rat with cuisine trimmings on a dinner-plate; Ilona Margolis’s first reaction to being placed on the graveyard shift is to go and smash out the headlights and windshield of Stephen Macht’s prized Packard with an axe; Macht doesn’t simply ask David Andrews if he wants to be on the graveyard shift, he has to turn it into a psychological game that taunts at his college background and how it relates to his needing more money; and when Macht is trapped down in the mine, his first reaction is not to try and escape but to put on blackout commando makeup and set about trying to kill David Andrews. At its most inventive, Graveyard Shift seems to be both a metaphorical as much as literal journey down into the dark, festering depths of the mill, with Stephen Macht’s manneredly ruthless Southern performance cresting it all like a B movie villain. Unfortunately, when the film reaches the depths it is merely another monster movie full of silly chompings and an even sillier monster. The ridiculously overwrought lead up to the action is by far and away the most interesting part of the film. Graveyard Shift was the only film directed by Ralph S. Singleton, a former assistant director and producer on tv’s Cagney & Lacey (1981-88). Singleton has worked as a producer on various films since then. Other Stephen King genre adaptations include:- Carrie (1976), Salem’s Lot (1979), The Shining (1980), Christine (1983), Cujo (1983), The Dead Zone (1983), Children of the Corn (1984), Firestarter (1984), Cat’s Eye (1985), Silver Bullet (1985), The Running Man (1987), Pet Sematary (1989), It (tv mini-series, 1990), Misery (1990), a segment of Tales from the Darkside: The Movie (1990), Sometimes They Come Back (1991), The Lawnmower Man (1992), The Dark Half (1993), Needful Things (1993), The Tommyknockers (tv mini-series, 1993), The Stand (tv mini-series, 1994), The Langoliers (tv mini-series, 1995), The Mangler (1995), Thinner (1996), The Night Flier (1997), Quicksilver Highway (1997), The Shining (tv mini-series, 1997), Trucks (1997), Apt Pupil (1998), The Green Mile (1999), The Dead Zone (tv series, 2001-2), Hearts in Atlantis (2001), Carrie (tv mini-series, 2002), Dreamcatcher (2003), Riding the Bullet (2004), ‘Salem’s Lot (tv mini-series, 2004), Secret Window (2004), Desperation (tv mini-series, 2006), Nightmares & Dreamscapes: From the Stories of Stephen King (tv mini-series, 2006), 1408 (2007), The Mist (2007), Children of the Corn (2009), Everything’s Eventual (2009), the tv series Haven (2010-5), Bag of Bones (tv mini-series, 2011), Carrie (2013), Under the Dome (tv series, 2013-5), Big Driver (2014), A Good Marriage (2014), Mercy (2014), Cell (2016), 11.22.63 (tv mini-series, 2016), The Dark Tower (2017), Gerald’s Game (2017), It (2017), The Mist (tv series, 2017), Mr. Mercedes (tv series, 2017– ), 1922 (2017), Castle Rock (tv series, 2018– ) and Pet Sematary (2019). Stephen King had also written a number of original screen works with Creepshow (1982), Golden Years (tv mini-series, 1991), Sleepwalkers (1992), Storm of the Century (tv mini-series, 1999), Rose Red (tv mini-series, 2002) and the tv series Kingdom Hospital (2004), as well as adapted his own works with the screenplays for Cat’s Eye, Silver Bullet, Pet Sematary, The Stand, The Shining, Desperation, Children of the Corn 2009, A Good Marriage and Cell. King also directed one film with Maximum Overdrive (1986).